Can three minutes really make a big difference in your life? 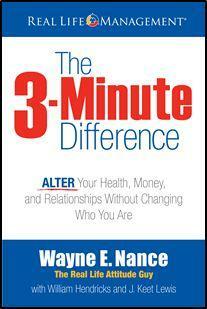 According to author, Wayne Nance, three minutes matters in three key areas—your health, finances, and relationships. By taking a three minute survey, readers can better understand why they behave the way they do and how it impacts those three areas of their lives. The survey consists of 4 rows of adjectives from which readers quickly select those that best describe you. And in three short minutes, you will receive your personal results which is a combination of four letters, T, R, I, and M. My pattern was TRMI, which classified me as a barge. And to my surprise much of the description of barges fit me well but it also provided some helpful information about how I might come across to others. Through this books Nance hopes to help individuals dealing with weight, debt, and relationship issues ALTER their life patterns. He does not subscribe to one size fit all plan. But he provides a 10 step plan for each of the three key areas. Wayne E. Nance, better known as the “Real Life Attitude Guy”, is the well-known developer of the ABCs of getting your life under control. He is founder and CEO of Real Life Management, Inc. With his help, more than 50,000 struggling people have successfully improved their lives and given Wayne credit for helping them do so. Top corporations, the U. S. Army, organizations, and churches throughout the United States also use the Life Management system for the benefit of their employees and leaders. Wayne has been called Dr. Phil Foxworthy, a funny guy with a serious message. Today, Wayne is a highly respected speaker, trainer and author of The 3-Minute Difference, Mind Over Money and Liten Up for Life. He previously hosted “The Real Life Attitude Guy” simulcast on Dallas radio 570 (Fox Network) and is currently working to launch that programming on the Web. As president and CEO of Real Life Management, Inc., Wayne’s life focus is to provide the education that he feels has been insufficient in matters pertaining to health, finance, relationship building and how they are related. Wayne lives in Texas with Shannon and their three daughters, Christel, Melissa, and Kara. Are you overweight, broke, or headed for divorce? Even one of these problems can be personally devastating. But what if you’re facing all three at once? Years ago, Wayne Nance’s life was out of control. An incessant smoker, he weighed 315 pounds. 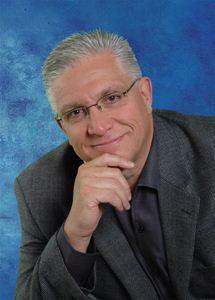 His marriage was disintegrating and his finances were bottoming out. He finally realized that his obesity, debt and relationship meltdown were surface problems resulting from his core attitudes and beliefs. In The 3-Minute Difference, Nance describes his journey back from the ragged edge of reality to a healthy, productive life. His personal journey uncovered a proven solution-a solution that can alter your health, money, and relationships in only three minutes. I want you to let your mind indulge in a little bit of fantasy for a moment. Imagine yourself in a very successful career. You’re making quite a bit of money—well into six figures. You’ve got a gorgeous 6,000-square-foot home with a fancy pool and a water- fall in the backyard. Parked in your three-car garage is an imposing Mercedes-Benz sedan. On your wrist is an enormous Rolex watch, the one with all the diamonds on it that dazzles everyone who sees it. Sound like a life you’d care to have? It did to me. It’s the American Dream, after all. And in 1984, I had that dream and more. I was the kid from the poor side of the tracks who had raised himself up by his bootstraps, got a good education, went to the big city, worked hard, and eventually met with success. But know this: if you had seen me living that dream in 1984, you’d have said, “Wayne Nance has the perfect life.” But you’d have been dead wrong! Because the truth is, my life was out of control. Meaning that I was making bad decisions that created serious long- term consequences for my happiness, health, wealth, and family. Do you ever feel as if your world is spinning out of control? A lot of us do in the post-9/11 world, with the economic downturn that followed, the disaster of the stock market and the loss of many people’s retirement funds, the ever-present threat of terrorist at- tacks, the downsizing of companies and the offshoring of American jobs, the erosion of values as corporate scandals have come to light, and so many other things that make us worry about the future. Those are serious matters, for sure. But did you know that there’s a crisis in America that actually affects more people on a practical, daily basis than any of those “world-class” headline-grabbers? It’s a crisis that shows up all over the place but can be seen most graphically in three areas that all of us deal with every day: the lifestyle issues of food, money, and relationships. To put it bluntly, way too many Americans are fat, broke, and unhappy at home and at work. • 67 percent of Americans are estimated to be overweight or obese by Centers for Disease Control (CDC) standards. • 85 percent of Americans will retire with Social Security benefits as their only means of support. In other words, they’re broke. Clearly, something’s wrong in America! Especially if you overlay those numbers on top of each other. Just imagine three pie charts showing the 67 percent of Americans who are overweight, the 85 percent who will retire virtually broke, and the 51 percent who are divorced. Stack them on top of one another, and what do you see? That a lot of Americans are all three—fat, broke, and unhappy in their relationships. But that’s not the worst of it. The saddest thing is that many people struggling with one, two, or even all three of these problems don’t even think they have a problem! Take obesity, for example. A 2004 Associated Press poll found that six people out of ten who qualified as overweight by government standards said their weight was just fine—healthy, even. What happens when someone goes into denial about their debt? They go deeper in debt. They may also start eating. Indeed, The Toque, a satirical Canadian website, imagines a VISA card issued by McDonald’s called (you guessed it) the McVISA. The idea is that people will be more likely to eat at McDonald’s if they can charge their Big Macs. Amblin racks up $2,100 on her McVISA card, even though it only has a $1,500 credit limit. The whole story is a spoof, of course. But it hits the nail on the head. “I can’t stop! I can’t help myself!” That’s the cry of someone whose lifestyle is out of control. Someone who is making bad choices that will create serious long-term consequences for their happiness, health, wealth, and family. In 1978, I was a poster child for being out of control in all three of the lifestyle areas I’ve mentioned. I weighed 315 pounds (that’s fat, by the way, even if you’re six feet, one inch tall). I was a financial advisor, but I had five credit cards maxed out. And at home, my wife, Shannon, wasn’t exactly happy with me because she and my daughter never saw me because I was too busy making money for the family. At least that’s what I always told them (and myself): “I have to work this hard to provide for our family.” Yeah, right! I was in total denial. I was caught up in a crisis that I didn’t even see. I was succeeding and making lots of money, and by society’s standards I was doing just fine. Only I wasn’t doing fine. You’re not doing fine when you can’t bend over and tie your shoes without being out of breath. You’re not doing fine if you’re giving great financial advice to other people, but your own financial condition is a house of cards just waiting to collapse. You’re not doing fine if you never spend time with your family because you’ve got to keep one step ahead of the hounds that are chasing you. Because I didn’t have any boundaries, I let other people’s opinions determine my opinion of myself. I looked fine to them, so I thought everything about me was fine, too. But it wasn’t. My life was out of control. Some people hit bottom and then finally wake up. I had to hit bottom three times before I woke up! (I’ve always known I was a slow learner.) The first wake-up call came in 1978, when I was twenty-eight years old, with a beautiful wife, a one-year-old daughter, and another baby on the way. I was just at the point when a young man should be enjoying life to the fullest. Instead, my doctor was warning me that if I didn’t stop eating, I’d never see my fortieth birthday. Was that what caused me to change my ways? No! Guess what I did when I left his office? I headed straight across the street to a pancake house. I’m not kidding! And I charged the meal on a credit card. (You see, I do understand someone like Amblin!) So what was my first wake-up call? It happened during my annual visit to the “Big Men’s” store. I was packing on so much weight that every year I needed new clothes—in the next larger size. You can imagine how embarrassing it was to make that trip. So it became my style to shift attention (and blame) away from myself by complaining about the clothing manufacturers in Asia and how they were cutting their styles too small, or to joke that my wife was shrinking my clothes in the washer. I was stunned. I’d never been so insulted in my life. How dare him! Boy, was I ever mad! So I showed him. Why, I walked right out of that store without buying so much as a dime of new clothing! But in truth, that guy did me a favor. Because what he said was true. And it hit home. I was fat. Overweight. Obese. Whatever you want to call it, it doesn’t matter. What matters is that I finally faced up to a cold, hard reality: my weight was out of control. With a background like that, it’s no surprise that early on I became the fat kid. Eventually, the fat kid grew up to be the fat man. Only I wouldn’t admit that I was a fat man. I had all kinds of excuses to say I wasn’t. I was in total denial. “Justifiable denialism” is what I call it. I lied to myself to justify my poor decisions. But the scales don’t lie, and your waist doesn’t lie, and your health doesn’t lie. And by the time I was twenty-eight I was getting sick and feeling tired. And to be honest, I was sick and tired of being sick and tired. So I did what almost everyone does when they finally accept the truth that they’re carrying too much weight: I went on a diet. In fact, I went on lots of diets. The grapefruit diet. The water diet. The low-carb diet. The six-meals-a-day diet. You name it, I tried it. Sure enough, I lost weight. And gained it back. So I’d go on another diet, and lose weight. And then after I’d lost the weight, I’d quit the diet and I’d gain the weight back. Plus a little bit more. So I’d go on another diet, and lose the weight again. And then . . . well, you get the picture. One diet I followed was Dr. Atkins’s first diet. He had two of them over the years. I tried the first one. He said if you ate about as much cheese and eggs and red meat as there are in the state of Texas, you’ll lose weight. I tried that and I did lose weight. I lost about forty or fifty pounds, and pretty quickly. But then I was diagnosed with a fissure tear in my colon, because I wasn’t eating any fiber or carbohydrates. Surgery laid me up for a month. And while I lay in that bed, I said to myself, “If I ever stop bleeding and get out of this bed, I’m going to learn something about nutrition,” because I had never learned anything about it in school. I had been an athlete, but in my day the people in charge just said, “Eat chicken-fried steak, Wayne. You need something that’ll stick to your ribs. Don’t worry about the gravy. You’ll run it off.” I knew nothing about nutrition, food supplements, or how to balance my diet. So when I got well, a friend told me about a book by Covert Bailey titled, Fit or Fat? Boy, was that a lucky break! Bailey had a great concept: fat makes you fat. That was in 1979. Amazing, isn’t it? Fat makes you fat. When I read that, I realized that about 98 percent of what I was eating contained fat. I also discovered that when I wasn’t eating fatty foods, I was eating Oreos and chocolate milk and stuff that was loaded with sugar. Bailey opened my eyes to a lot, and I was shocked to learn how much I didn’t know about nutrition. After that, I couldn’t learn enough about it. I got really serious about what I ate, and I lost more than a hundred pounds over a two-and-a-half-year period. All of a sudden I was the new thin guy. The 205-pound guy instead of the 315-pound guy. So I’d gotten my life under control, right? Not exactly. I was only focusing on my weight. My spending was still out of control. Which means my work habits were out of control. At 205 pounds I wasn’t spending any more time with my family than when I’d weighed 315. I’d gone from being a big, fat, broke man with a lot of stress and an unhappy family to a thinner broke man with a lot of stress and an unhappy family. Fast forward to 1984. By then, as I’ve said, I was making quite a bit of money. I had the house, the car, the watch, the American Dream. I sincerely thought I had it made. And I was thinner, too. But soon I was dropped off at the hotel. Sure enough, I had my big private suite, all decked out with a complimentary fruit basket and a bottle of champagne. That was kind of cruel in a way, because I didn’t have Shannon there to enjoy it with me. The fact is, she had declined to come to the convention. She didn’t like being with me at that point in my life, because I was pretty much a jerk. I didn’t really know what to expect. Nothing happened right away. I finished the convention, collected my award, and went home. About a week later, Shannon told me that our girls’ elementary school was having an open house, and she wanted me to go and meet their teachers. I was still feeling kind of depressed, so I said I didn’t want to meet any teachers. But for some reason I relented and went anyway. My older daughter’s fourth-grade teacher had asked the students to make posters in answer to the question, “If you could have three things in your life, what would you want?” I looked carefully at the artwork arrayed on the bulletin board. Of the thirty-two kids in that class, twenty-six of them had drawn as the top three things they wanted out of life: more money, a sports car, and a big house. Within a year of that night, we sold the house, got a smaller house in a different neighborhood, I traded in the Mercedes for a pickup, started wearing cutoffs, and got a Mickey Mouse watch made of plastic. I said to myself, “I don’t know where I’m going from here, but I’m going to refocus.” And in that way I came to grips with the fact that my financial lifestyle was out of control, and I needed to start dealing with the money issue, just as I’d worked on the weight issue. But I wasn’t out of the woods yet. Far from it. In 1992 Shannon and I hit rock bottom in our marriage. Remember, I’d been in denial for years thinking that if I just provided a nice lifestyle for my family, they’d think I was great. Sure, we’d downscaled to a more modest home and all, but I was still providing well for my family. But one day Shannon finally decided to cut to the truth. “Wayne, you’re basically a jerk,” she said. You can see that people sometimes have to shoot pretty straight in order for me to “get” what they’re saying. So I did. I went for counseling and had a lot of discussions over a long period of time. I came to grips with the fact that life is complicated. You can fix one thing about yourself, but that may only lead to problems with other things. The real question is, what’s driving your behavior? What’s the underlying thing that’s creating all the surface problems you’re trying to fix? That core thing is what you’ve got to go after. It was at that point that I encountered a powerful truth: there is more to managing one’s lifestyle than merely making “right” choices. You see, almost all the diets, budgets, relationship books, and other lifestyle advice I had gotten said that if I just made the “right” choices, everything would work out. Just eat less fat. Just stay within a budget. Just tell your wife you love her more. Just show up at your kid’s soccer game. Just count to five when the annoying person at the office pushes your buttons. Those were all the “right” choices. Do those and you’ll get your life under control. Problem is, I’d made a lot of those “right” choices. But my life still was not working. Worse yet, I was having to put enormous energy into making “right” choices. So much energy, in fact, that if I let my guard down for an instant, or if I felt tired or down or angry or whatever, I’d just blow off my resolve and do it the old way— order that extra meat patty and the double fries, buy that tie that cost twice what I intended to pay, take on that extra speaking engagement even though I’d promised Shannon I’d be home that weekend. Clearly, something else was contributing to my behavior besides making “right” choices, important as those were. When I learned that the core of my lifestyle problems was my attitude, I started on a journey that continues to this day. I wondered, “Am I the only person in America who is struggling with food, money, and relationships?” What I discovered shocked me. I began going to health spas and fitness centers, where I traded speaking and training for the opportunity to interview spa participants. That gave me lots of firsthand data about the issues people really struggle with. I found that millions of Americans are in crisis in those three areas. In addition, I discovered that there is a link among those three issues—obesity, debt, and divorce. The link is people’s underlying attitudes. I discovered that certain attitudes are especially at- risk for obesity, debt, and divorce. In other words, many of the same people who struggle with their weight and other health issues struggle with their money and related financial issues, and also struggle with their relationships, both at home and at work. They struggle because of their attitudes. And sadly, they don’t even realize that their attitudes are leading to self-defeating and self-destructive behaviors! Would you like to know whether you (or someone you care about) are one of those people? Better yet, would you like to know how you can regain control over your lifestyle, no matter what your wiring may be? This book will help you do that. First it will help you understand your attitude and how it affects everything you do and every decision you make. Then it will take you through the same five-step plan that helped me lose more than a hundred pounds and keep the weight off for more than fifteen years. The same plan that helped me pay off my five credit cards, so that today Shannon and I live debt-free. The same plan that has allowed Shannon and me to stay married—and increasingly happy—for thirty-one years. Now let me point out that I have not written this book on my own. This is a joint venture between me and my co-authors, Bill Hendricks and Keet Lewis. We decided that we would write the book from my perspective, using the first-person singular (“I,” “me,” “my”). But rest assured that this book expresses a common understanding among three partners. Indeed, Bill and Keet will tell you that they, too, have felt out of control at various times in their lives. They use this program daily to better manage their lives and businesses. Bill understands the challenge of keeping life in balance, having lost his wife to breast cancer several years ago, and single- parenting his three daughters in their adolescent and teen years. Meanwhile he has headed a consulting practice that uses the phenomenon of giftedness to work with businesses, nonprofits, and churches to manage their strategic “people issues,” and with individuals seeking career guidance. Keet has an extensive background in managing companies spanning several industries. Today he is a busy entrepreneur with a variety of business and charitable activities. He teaches the concepts in this book in his consulting work with companies, schools, and religious organizations. Like me, he has struggled at times with his weight and finances, and he has personally witnessed the success of our program. Keet began his personal dedication to understanding behavioral science when, as the CEO of a manufacturing company, he studied and applied the principles relating to temperament as explained by bestselling author Dr. Tim LaHaye in his classic work, Why You Act the Way You Do. Dr. LaHaye wrote many other books on temperament, and they are a must read for any serious student of the subject. Additionally, Dr. James Dobson, Dr. John C. Maxwell, Dr. Steve Farrar, Dr. Howard Hendricks, Dr. Bill Bright, Josh McDowell, Dennis and Barbara Rainey, Dr. Tony Evans, Rich DeVos, Dr. Ron Jenson, Dr. Jack Graham, Judge Paul Pressler, and Bill Hawkins have all contributed much to our understanding of life- style issues like parenting, personal responsibility, and leadership through their very insightful writings. All of them have helped to lay a foundation for our work at Real Life Management. Keet, Bill, and I hope that this book will be a helpful complement to the work of people like Bailey, Ziglar, LaHaye, Dobson, Maxwell, Rainey, Jenson, and others who have pioneered in the field of attitude and lifestyle management. Above all, we want this book to offer hope. If I was able to regain some control of my life, you can do the same, no matter how desperate you feel your life has become. I’ve helped countless people just like you over the years through my training workshops and seminars at corporations, health spas, financial planning firms, universities, churches, and many other settings. Almost all of the folks I’ve met have tried way too many of the quick-fix diet, budget, and relationship gimmicks on the market. Most of them were discouraged. A lot of them were desperate. Some had even given up. “I’ll never change!” They said. If that’s how you feel, I implore you to keep reading. Because I’m not going to ask you to change. You read that right. I’m not going to ask you to change. The word “change” implies that you need to make a 180-degree turn- around and basically become someone other than who you are. I’ll never ask you to do that. God wired you the way you are, and I’m fine with that. I want you to be fine with that, too. You are just fine the way you are! But I know you’re not happy with the way you live. So come on inside this book with me, because I’ve developed a proven strategy to help you turn your life around. Disclosure: I was provided a complimentary copy of The 3-Minute Difference from the B&B Media Group as a part of the FIRST Wild Card Tour. What a read, Wanda, and this is only the first chapter. The word that struck me was ATTITUDE. When I was little I had an aunt who would always say, “straighten up your attitude!” She was not one for physical punishment, but she was sit us down and talk to us on every immaginable issue. As I’ve gotten older, I understand now why she was so focused on attitude. The instructions I heeded and put into practice have saved me from inflicting loads of pain on myself and others. It really was an interesting book LaVonne. While it maybe a bit cliche to say our attitude impacts our altitude but it has such truth. Finished . you have penned in The 3-Minute Difference | The Watered Soul just isn’t only great but usually sorts of important. I know a bunch of people don’t really consider of these tips. actually doing a things. This is actually reason I enjoy reading about other peoples aspects of views and experience.